Will Horsham follow play-off rivals Hastings United, Haywards Heath and Ashford United with late signings? Horsham manager Dominic Di Paola has ruled out following in his play-off rivals’ footsteps and bringing in last-minute signings or loan players. Hastings United, Haywards Heath and Ashford Town all strengthened their sides last week with impressive new additions – Hastings adding Gillingham loan pair Bradley Stevenson and Jack Tucker. 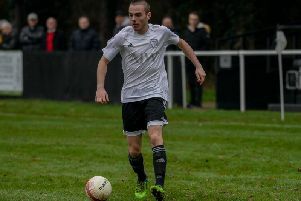 Heath brought in the impressive Kenny Pogue and Ashford United acquired Lee Prescott, who played against Horsham in the top-of-the-table 0-0 draw on Saturday. It’s clear they are bolstering ahead of the Bostik League South Division play-off run-in and subsequent promotion games, but Di Paola has said they won’t be adding any new faces. Firstly, the club’s budget with limited revenue streams is already stretched and secondly, he believes the current squad have earned the right to see out the season. Di Paola explained: “Ashford brought in Lee Prescott from East Grinstead, who is a very good player. A very good holding player for them, but I do not think it is right for us to do that now. We have the numbers. “People like Dan Hogan I feel for. He’s a really good player, we just have not been able to play him enough and that’s unfair on him. So I didn’t really want to bring in anyone else. “It’s a bit of both, we are not in the position as a club at the moment to stretch ourselves more than we already are and I wouldn’t expect the club to do that. “I think we have a good squad and great bunch of lads that have been in it from the start of the year. Why should I do that really? “We have had to sign Dean Pearse and Dan Hogan, but why should I stop a couple of players having the opportunity when they were here in June, boiling hot and a burnt-out pitch up at Collyer’s. They have done all that graft and gone all through the winter. Why should I at the last minute bring in a couple of loan players from Brighton or something? It doesn’t sit right with me, but that’s just my choice. “Each to their own. You don’t know what is going on in the inner circles of teams. Maybe Hastings might have been short in those areas in which case they have brought in players to fill areas where they are struggling. Saturday’s 0-0 draw with Ashford saw Horsham slip a place to third, although both are level on 59 points. Ashford are fourth on 58 points and Haywards Heath fifth on 56, although both have a game in hand. Hythe Town sit just outside the play-off places on 47 points, but have played the same amount of games as Hastings and Horsham, who host Sevenoaks Town on Saturday. Di Paola added: “You will pick up points some places you don’t expect to and you’ll lose some places you don’t expect to. There are five games to go and it’s another good side out of the way. Will Miles is continuing to build fitness on his return from a hamstring injury and was warming-up with the side against Ashford last weekend.